What does an old woman think about? What are her thoughts? Does she think of loneliness, or love, or of life, and lust? What if she is independent at that? What if she is surrounded by books and her life comprises of nothing else? This is the story that Rabih Alameddine has conjured for us in the form of his latest book, “An Unnecessary Woman”. Aaliya (above it all as her name implies) is a woman in Beirut in her early 70s. She is the heart and soul of the book. She is to me more than a mere protagonist. You don’t come across such strong characters every day in books and when you do, you cherish them as you must with this one. Aaliya is a woman of great intelligence in a society that does not expect its women to be that erudite. She is an observer of things, incidents, people and times. The book chronicles her life and more than anything else it is a book of her relationship with books and reading. She translates popular books from English to Arabic for her own pleasure. Men have disappointed her. Books do not. She takes refuge in them. She also works at a bookstore and tries to avoid her family as much as she can. At one point, I almost felt that I was her, or in time I would be her. That day maybe isn’t far off. At every given time in the book, Aaliya is trying to work her way through feelings of uselessness and loneliness. That is where the title of the book fits in. So much so that when she accidentally colours her hair blue, she lets it be. That is the only newness in her everyday monotony. Alameddine is a fantastic storyteller. He has managed to tell a tale of a woman, without letting his manhood get in the way and that to me is a mark of a great writer. The book cuts across barriers of language and nationality and tells a tale that is universal to all – about loneliness, aging and how to cope in this world that is constantly judging and will not let you do. He speaks of these issues without bringing the reader down, also with some humour at most times. 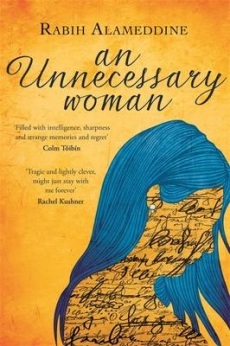 “An Unnecessary Woman” is a must read for all lovers of literature. It is almost a love song, dedicated to reading and readers everywhere. This entry was posted in Books, Constable and Robinson, Hachette Book Group, Literary Fiction, Reading, Review and tagged An Unnecessary Woman, Beirut, Books, Constable and Robinson, hachette book group, Rabih Alameddine, reading on February 1, 2015 by thehungryreader.